L-arginine is the natural form of the amino acid arginine that you find in food, but manufacturers can also synthesize it to create L-arginine dietary supplements. L-arginine alpha-ketoglutarate, or AAKG, is a complex dietary supplement that contains alpha-ketoglutarate—a salt-derived from glutaric acid. Speak to your healthcare provider before choosing between these supplements or using any type of dietary supplement. Doctors may prescribe L-arginine supplements in the treatment of cardiovascular diseases like congestive heart failure and intermittent claudication, according to the New York University Langone Medical Center. There are also small clinical trials that support arginine for the treatment of diabetes, hypertension and even the common cold. AAKG is less common for clinical uses, as manufacturers tend to market the supplement to athletes, particularly bodybuilders. AAKG purportedly increases your vasodilation, so your muscles receive more oxygen and nutrients for performance and growth. National Strength and Conditioning Association-certified strength coach David Barr states that manufactures of AAKG often claim that the alpha-ketoglutarate in the supplement can improve arginine absorption or cause a “time-released” effect on the arginine. There is no scientific evidence to support these claims, and it is likely that AAKG produces similar boosts in blood arginine levels as L-arginine supplements. L-arginine is most effective when used to increase nitric oxide levels for the treatment of congestive heart failure, and has had three small double-blind, placebo-controlled studies to prove its efficacy. Some small trials have shown some promise for arginine supplementation in the treatment of male impotence as well, but many of these studies lacked appropriate controls. One 2006 study in the “Nutrition” journal showed trained men consuming AAKG were able to significantly increase their one-repetition maximum for the bench press after eight weeks. Barr questions the validity of these results, however, because the men showed no increases in body mass to accompany such strength gains. 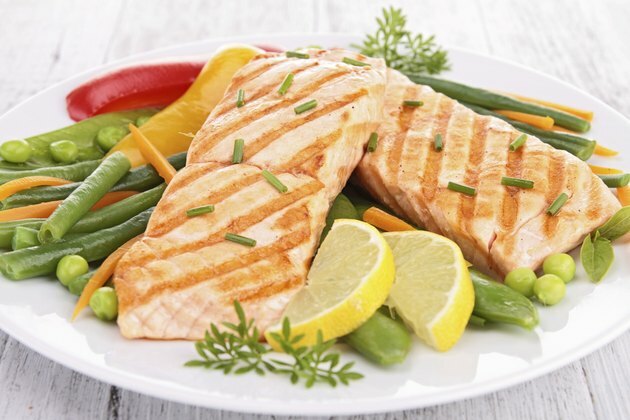 L-arginine may be safer for you to consume because it is the natural form of arginine you would normally consume in foods like meat, poultry and dairy products. New York University states that most people can tolerate arginine in doses up to 20 grams per day with only minor gastrointestinal distress. However, L-arginine supplements may also stimulate stomach acid production, alter your potassium levels and interfere with the treatment of herpes. AAKG can be significantly more dangerous than L-arginine because AAKG supplements may contain additives and contaminants. Registered dietitian Ellen Coleman states that many times these contaminants are the result of poor manufacturing processes, but sometimes they are deliberate adulterations with chemicals like anabolic steroids to improve the performance of the product. A few hospitalizations for heart palpitations, dizziness and vomiting have been reported after consuming AAKG supplements.